Comedian, best-selling author, and talk show host Chelsea Handler, 36, has frequently been mentioned in this column. The daughter of a Jewish father and a Mormon mother, she was raised as a Reform Jew and she and her five siblings were all bar or bat mitzvah. On her hit E! cable network talk show, Chelsea Lately, Handler often refers to herself as “Jewish” or “half Jewish” so it’s no surprise that she would have a Rosh Hashanah segment on her show this month. 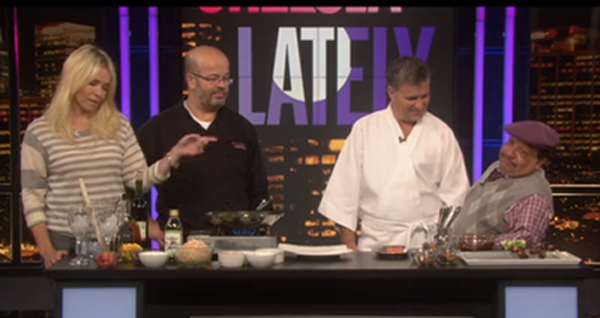 On September 7, Handler invited her brother, Roy Handler, a professional chef, on to the show to cook four Rosh Hashanah “appropriate” dishes. Roy and Chelsea are close and even live together. The TV segment featuring Roy cooking his dishes was, frankly, a bit of a disappointment to me. I think you will agree that there was too much banter between Roy, Chelsea, and Chelsea’s agent and the cooking took second place. Nobody would be able to figure out how to make the dishes based solely on that segment. But, I liked the look of the dishes, so I checked Roy’s website and located the recipes for them. I found Roy’s written cooking instructions to be very informative. Only the first four dishes on the linked page are for Rosh Hashanah: potato pancakes with applesauce, red sangria, salmon with honey glaze and chocolate-dipped figs. Two tips from me: Roy Handler specifies using kosher wine in a couple of recipes. That’s very appropriate for a Jewish holiday, whether or not one normally keeps kosher. However, he doesn’t note that brandy, called-for in his sangria recipe, is a refined form of wine, so if you want everything really kosher, look for a kosher brandy. Also, if you just Google “best kosher wines,” you’ll find many other lists on the websites of Jewish and general wine publications. Kosher brandy is tougher to find so I recommend omitting it from Roy’s sangria recipe or consulting this website. It lists five kosher brandies. Rosenfels and Lorig are the sons of Jewish fathers. Camarillo, De La Puente, Garay, Kosier, and Mays are the sons of Jewish mothers. Carimi, Olshansky, Podlesh, and Schwartz have two Jewish parents. Carimi, who was recently profiled in this column, is the only rookie this year. A practicing Jew and a great college player, Carimi was the Chicago Bears’ first round draft pick. As I recently reported, Carimi’s Jewish father, Dr. Sanford Carimi, took the last name of his Italian stepfather. Gabe Carimi’s mother, Alayne, is a Jew-by-choice. As far as I know, Garay and Mays, who have both been profiled in this column in the past, are the only interfaith players who were raised religiously Jewish. The other interfaith players were raised secularly. However, when contacted by Jewish Sports Review, they, like all athletes the Review contacts, confirmed that they were not raised in a faith other than Judaism and that they had no objection to being identified as a “Jewish athlete” in the pages of the Review. Garay, by the way, is coming off a really amazing year. 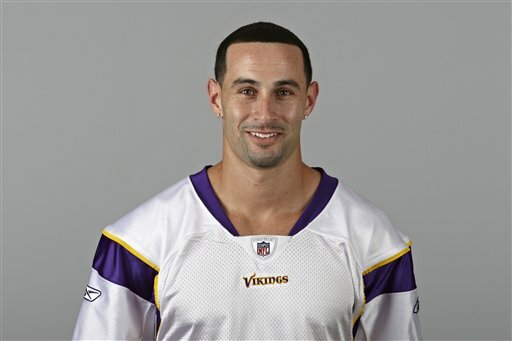 He broke into the NFL in 2003 and has been on the roster of four different teams. Unfortunately, he suffered from a seemingly endless series of injuries that caused him to be sidelined during all or part of the 2003-2009 seasons. He played in only 16 games total during this six year stretch. Last year, he stayed healthy and played for the Chargers in every season game (16). He started 15 out of those 16 games. Things were not so good for Mays, who was the San Francisco ?49ers’ 2010 second round draft pick. Despite some bright rookie moments, he showed more weaknesses in his play than the ?49ers new management liked to see and they traded him to Cincinnati during the off-season. The 2011 season will probably determine what sort of future Mays has in the NFL. Olshansky was almost out of the pros. He had many seasons as a top pro player, but his performance declined markedly last year. The Dallas Cowboys cut him rather than pay him almost four million dollars for this season. However, on September 20, the Miami Dolphins signed him to a one-year contract. Sad to note: San Diego Charger David Binn, whose father is Jewish, was released by the Chargers just before this season began. He played the specialized position of “long snapper”. Binn played 17 seasons with the Chargers, a team record. While still described as a “free agent,” it is doubtful another team will sign Binn at age 39. In my last column, I gave you a run-down of Jewish and interfaith actors with important roles in new broadcast TV shows that premiered on or before September 22. Here are three more thespians in new series, all of whom are of interfaith background. The first one, below, was accidentally omitted from my last column. Starting on Thursday, September 22, at 8:30 p.m., was the new NBC comedy, Whitney, starring comedian Whitney Cummings in the title role. Whitney has been “happily unmarried” to Alex (Chris D’Elia) for five years,but she’s afraid of boredom setting-in and often consults her funny girlfriends, including “Lily,” played by interfaith actress Zoe Lister-Jones, 29. Lister-Jones, who was raised in her mother’s Jewish faith, is a multi-talented artist who sings, writes plays, and acts. In 2007, she played an Orthodox Jewish woman who becomes friends with a Muslim woman in the indie film, Arranged. Starting last night, Monday, September 26, at 8 p.m., was the FOX sci-fi action series, Terra Nova. In 2149, the Earth is dying and a group of people go through a time portal to distant prehistoric times in order to establish a colony and help save the human race from extinction. The paramilitary leader of the colony is played by Stephen Lang, 59. An amazingly fit guy, Lang played the hard-nosed Marine commander in Avatar,. Lang is the son of Eugene Lang, 92, a quite famous Jewish businessman and philanthropist. The elder Lang earned millions as a high tech innovator and has given away at least $150 million to various good causes, mostly education-related. He’s the founder of the “I Have a Dream Foundation.” The son of Hungarian immigrant parents, Eugene Lang was married to Stephen Lang’s mother, Theresa, who was of Irish Catholic background, from 1946 until her death in 2008. Years ago, I saw an interview with Stephen Lang in which he said he identified as Jewish, but wasn’t religious. Also starting September 26, at 9 p.m., is the CW Network drama, Hart of Dixie. Rachel Bilson, 30, (The O.C. ), stars as “Dr. Zoe Hart,” a new doctor from New York who gets her first job practicing in a small Alabama Gulf Coast town. As noted in past columns, Bilson is the secular daughter of a Jewish father and mother of another faith. Bilson’s new show is produced by Josh Schwartz, who is Jewish. Schwartz also created The O.C. and Schwartz has taste, so Hart may be more than just a re-hashed version of the hit movie, Doc Hollywood, which had a similar plot line.